Yesterday, I was on The Rachael Ray Show! I can’t even believe I just typed that! A few weeks ago, I got an email that stopped me in my tracks…the subject line said, “RACHAEL RAY SHOW” …just like that in big, capital letters. They wanted to know if I would be interested in putting together a quick DIY hack video for them, and of course, I said yes! 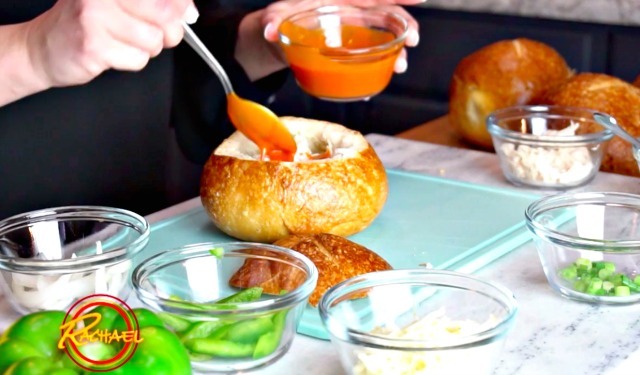 I had a quick phone conversation with one of the producers and we decided on Buffalo Chicken Deep Dish Pizza using a bread bowl, and she told me that if I felt comfortable, I could record the video myself and send it to her for editing. I’ve been working on video quite a bit lately, so I was super excited for the opportunity to shoot it myself! I kicked my family out of the house for a few hours on a rainy Saturday and recorded the tutorial from a few different angles so hopefully they could put together a decent video for the show. Let me tell you…I’ve never been more nervous and critical of myself in my entire life. Watching and hearing yourself back on video is really hard y’all! I finished recording the video, sent them over to the show, and waited until Monday to hear back. I was soooo terrified that they would get back with me and tell me it wasn’t going to work, but they didn’t. They loved it! Last week, the producer emailed me to say it would be airing on the Tuesday, January 31st episode, so I braced myself. It turned out better than I imagined it would, and has sparked a new interest for me! I’ll be sharing more videos with myself included in them going forward. I feel like this will allow me to connect with you on a more real level, and I hope it will help make the steps in some of my DIY posts easier to follow…sometimes just following picture directions is hard. You can check out my segment here, or if you’d like to see it a little bigger and check out the full recipe, visit The Rachael Ray Show Site HERE! Sooooo cool!! You did great!! This is perfect for my Super Bowl spread!! I caught it yesterday on the show. You were great. Could not tell you were nervous at all. Great job!! You came off like a pro!!! How exciting for you–Congratulations! Needless to say, I will be adding this to my meal plan! Thanks for the idea. You did a great job and looked as cool as a cucumber! I’d say it was a major success!!! I only just recently started to read you blog. It was interesting to put a live person with all the good home-made hacks. I watched the show yesterday and you did a great job. I know how you feel about doing stuff like this live. I use to be the same way when I sang or spoke in front of a large audience. It will get better and easier. Good Luck to you!!! Jess, you did a great job on the Rachel Ray show. I’ll be trying out your recipe soon! It looks delicious ???? I saw you and you were just as I imagined from the many emails I get from you. you were great on the Rachael Ray Show! you didn’t look nervous at all. Great job! EXCELLENT JOB and so deserved. You have served others with your great recipes and hints to save us not only time but money. Thank you for all you do to make each of us enjoy a better day after your great ideals. Keep on keeping on, you are a natural on the video. Not a lot of nonsense words, just a moving video showing what to do. So appreciated. It is irritating to watch those who so obviously just want attention to themselves along with their subject. Again you are a professional and gave a great sincere lesson. njoy your future. You were great on Rachel Ray show, it was and the recipe was very good also. You were wonderful! You did a fantastic job! Congratulations!! Can’t wait to see more videos from you. Keep up the great work! Are you going to print the recipe? 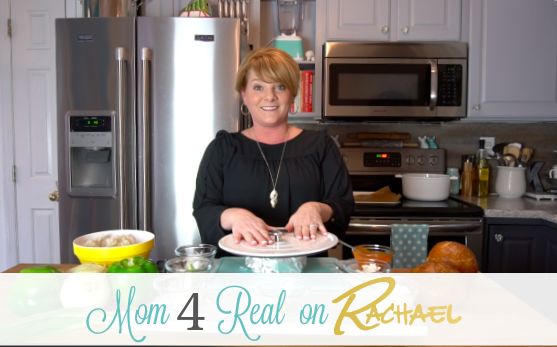 I clicked the link to go to Rachael’s site but it didn’t include the recipe. Super cool to see you do what you love to do! You are a natural, excellent! I subscribe to your emails, so happy you posted the segment,I missed the segment on TV. I was at work and missed the show, but just watched your segment and you did AWESOME! Congrats sweet friend! Great Job! I look forward to more videos from you. Thank you for all the great tips and tricks you share. The recipe looks wonderful & yummy. You didn’t look at all nervous and did this with such finesse! Good job! You were fabulous. So glad you put the link on the email; although I knew you would! You were clear and concise in words and well done on the “showing us how” part. You’re a natural Jessica! You need to have your own TV show!! You’re a natural Jessica! You need a TV show of your own!!! Wonderful! Concise, well worded and to the point. Easy to follow and left me wanting to make it. Hope to see more of this in the future as I enjoy every thing you put on the site and use lots of your info. Which video app did you use and which one would you recommend? Oh my goodness…you made my day! Who is your grandmother? I recorded the video using my Sony a6300 camera…it is amazing!